Surgical lasers are multibillion-dollar global industry. However, it is difficult to forecast the pure laser sales as it is just a part/component of vertical or upstream system offerings. Lasers are widely utilized in medical field, from cosmetic procedures to diagnosis & therapy. Surgical lasers market is in a period of considerable flux. Technology, economic and regulatory forces tends to influence the market of surgical lasers. Paradigm shift towards medical imaging procedures is the major growth driver responsible to take surgical lasers market on new heights while stringent government regulation policies pull back the surgical lasers market. Healthcare in US is in its transition state; the trend is moving towards affordability rather than being expensive. Medical and cosmetic sector represents 10% of the whole laser systems market. Lumenis (Israel) and Cynosure (USA) are two laser systems developers in this sector who are making strides to move upstream. The femtosecond laser Origami XP from Onefive is largely integrated into ophthalmic operating stations. It offers the highest portability and the easiest possible system integration thanks to its innovative air-cooling system, reduced footprint and removable handle bars. Global medical laser market by end user was worth approximately USD 2.75 billion in 2008. This market declined to less than USD 2.25 billion in 2009 due to the impact of recession in major economies; however, it has seen the growth of nearly USD 4.60 billion between 2009 and 2014 at a CAGR of 16.2% over the 5 years. Ophthalmic (40%) and cosmetic (35%) is the major field of global laser market followed by surgical (23%) and dental (2%). The global surgical lasers market is expected to reach USD 3.0 billion by 2024 at a CAGR of 6.5% over the forecast period. The CO2 based lasers are projected to be the fastest growing among laser type category of segments in global surgical lasers market. Laparoscopic surgery is expected to overpower the other procedural segment due to the maximum trained surgeons in laparoscopy surgeries and demand for minimally invasive surgeries. The dermatology and ophthalmology is the largest segment due to increase awareness of medical technology and implementation of reimbursement policies while urology tends to be the fastest growing segment attributing to the increase prevalence of urological disorders (renal cancer, kidney stones, prostate enlargement, etc). North America is the most attractive surgical lasers market due to significant medical reimbursement policies and use of innovative surgical procedures adopted by healthcare professionals. Europe being the second largest market for surgical lasers due to increasing emphasis of aesthetic treatment on youth, rising establishment of medical spas and rising demand for less or non invasive surgical procedures. Furthermore, noncore physicians are also involved owing to the high margin business that these procedures generate. However, growth tends to be fastest in Latin America and APAC at the CAGR of approx 10% due to the rise in number of cataract surgeries, increase popularity for medical tourism and falling cost of surgical lasers. Increasing use of femtosecond lasers for cataract surgical removal by performing precise ocular microsurgeries spurs the expansion of the surgical lasers market. Use of laser technology with optical coherence tomography in early detection and diagnosis of eye disorder drive the popularity of ophthalmic lasers. Soft tissue lasers in the treatment of periodontal disease tend to increase the need of laser in dental surgeries and diagnostic procedures. Innovation in technology of diode lasers and fiber lasers fuels growth of global surgical lasers market. Due to awareness about the advantages such as reduced blood loss, reduced chance of wound infection, decreased postoperative discomfort, and better wound healing also drive the global surgical lasers market. High procedure costs and limited medical reimbursements are restraining the growth of surgical lasers market. 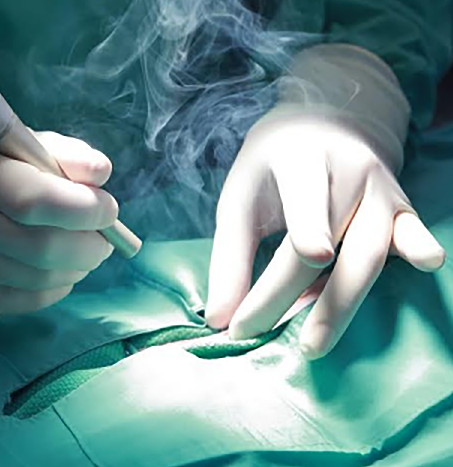 Safety concerns associated with the use of surgical lasers is also one of the key challenging factors. In addition, injectables in cosmetic surgeries are among the noninvasive treatments most frequently being considered by consumers overpowers the surgical lasers market. Global surgical lasers market is also influenced by global economy prospects like declining commodity prices, weak global trade and manufacturing activity in advanced economies with high-debt-level/low interest rate policies and increased political uncertainty such as Brexit and Trump presidency. In Europe, as the stigma associated with surgical laser procedure is fading which in turn tends to propel the global surgical lasers market. Europe has 3,544,572 aesthetic procedures accounting for almost 25% of medical aesthetic device market. France has the highest number of surgical laser procedures followed by Germany.